If you own your own Independent Insurance Agency, you probably started as a one-person show. Maybe you still are your only employee. The average independent insurance agency is a small venture, and it’s typically, as you know, that everybody has to wear multiple hats. It can even feel like you’re doing things more efficiently by doing it all yourself than by trying to bring anyone else onto your team. But if you’re thinking that, you might be wrong. It’s hard to relinquish control of something you’ve worked so hard on. It’s hard to move away from sales, when you’ve been your company’s sales person of the month for all of the months. But if you want your business to grow, you’re faced with something every successful entrepreneur is faced with eventually: Is it time to hire another sales person, and how do I go about doing that? Don Miller, the marketing and branding guru behind Story Brand has some tips just for you. Every minute you spend selling represents lost potential. If you’re an entrepreneur, your company needs you to lead, not sell. Even if you’re gifted at it, it’s taking you away from creating strategic plans, taking care of your staff, or dreaming about the next big thing. Plus, you probably have a blindspot. As entrepreneurs, we tend to be so close to our product or service that we don’t know how to talk about it well anymore. We fixate on product details. We take weird tangents. And we forget that leads won’t give a hoot about any of it. Your business exists to create customers. Why not have people that spend their entire day finding more customers for this wonderful product or service that you’ve created? Hiring a salesperson feels like — and is — a major investment. As a result, we tend to put it off. “Maybe next quarter,” we think, and before you know it a year has gone by. But good salespeople pay for themselves, and quickly. Average those responses, and that’s your sales cycle. Once you know that, you determine how long it will take before a sales rep can, at the very least, pay for his or her own salary. For most businesses, this is going to take about 90 days. So congratulations, you now have a timeline for hiring a salesperson (and no more excuses not to). Let’s recap: you know you’re not going to keep selling. 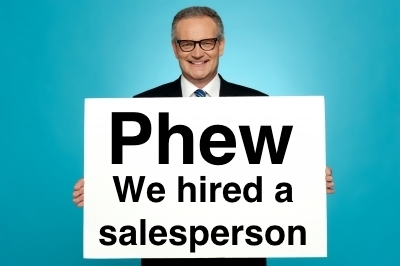 You know that the time to hire a salesperson is now. Next, let’s figure out how to get the right person on board. Why not move your super-smart staffer Nancy over to sales? Nancy knows your business. You know Nancy. Nancy is a hard worker, and she’s smart. You can train Nancy to sell. Why not Nancy? Here’s why Nancy probably won’t work: the best sales talent is hired rather than trained. That’s because great salespeople naturally migrate to selling. If Nancy is your killer salesperson, she is already selling because she can’t resist it. If not, you need to look elsewhere. Look for people who are already working and selling successfully at other companies. Think about it: someone who’s applying for a job has probably been unsuccessful selling someone else’s product. That’s not who you want to bring on. The main thing that contributes to a sales rep’s success is how passionately they believe in the product or service they’re selling. So start by looking at your existing ambassadors and customers when you’re hiring a salesperson. Your offer may be compelling enough to walk away from another gig. Give your new hire clear expectations of the path to success: “We expect you to meet with this many people, or have this many phone calls, each day.” In the early days, this is more important than results. That’s because we know that, in sales, activity always precedes results. For more product highlights and business tips for Independent Insurance Agents, check back on our blog every week. And to Quote our Wholesale Insurance Products Online, click HERE NOW.